The cost is 550RMB (about 85 US$) per person. It includes transportation, entrance fees, water, lunch and guides. We give 10% discount for members and kids under 12’s. We will climb up directly to this top watch tower through a trail in the mountains, passing by the Simatai reservoir, a small village. And then we head out to the topmost tower. Some parts of the trail are steep but they are pretty safe. It will take us 2-3 hours to reach the Watching-Beijing Tower. Though it isn’t an easy hike, those up for the challenge will reap the rewards. From the tower there is a very wide view. 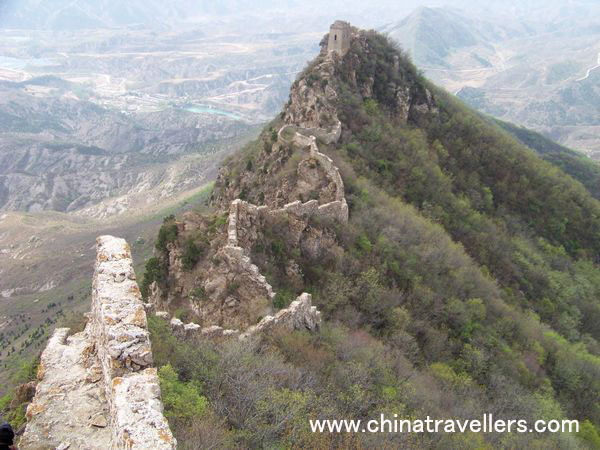 Viewed from a distance, the Simatai and Jinshanling Great Wall is like a giant dragon, stretches for a long distance. Looking down from the tower, the hills nearby are like the flat ground. After lunch we will begin our descent along the other side of the Mountains. Our final destination is a village with a lot of pear trees and our bus will be waiting for us there. We will have a late yet big lunch at a local farmer’s guest house after the hike. Level 4 hikes are suitable for people who are fit and healthy, doing aerobic type exercise regularly and have prior hiking experiences.